Commercial Outdoor Blinds Adelaide – Café Blinds · Pub Blinds · Alfresco Blinds. Cafés, restaurants, pubs and businesses in general that have outdoor living areas, look to ‘Inviron Blinds Adelaide’; the trusted name for outdoor commercial blinds in Adelaide. Commercial outdoor blinds Adelaide businesses require include PVC blinds available as clear PVC blinds or tinted PVC blinds plus our Environshade blinds. Made using marine grade components, these commercial outdoor blinds are manufactured to last and protect customers from Adelaide’s Sun, wind and rain. For extreme situations, where wind and rain conditions are extreme, commercial PVC blinds come 1mm thick. 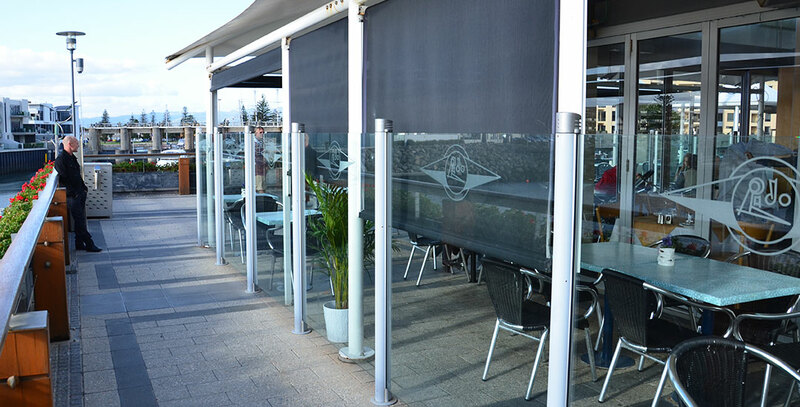 For beach front situations or across the Adelaide Hills, these commercial cafe blinds handle the harshest elements in their stride. Marine grade stainless steel fixtures and fittings coupled with the Ziptrak® Track Guided Blind System ensures years of protection. In fact all PVC blinds come with a 5 year warranty for your peace of mind, but if cleaned and maintained correctly and regularly, will last many times more. Both with a 10 year warranty, our Environshade® Plus and Environshade® Ultra outdoor alfresco blinds are manufactured to handle the harsh Summer’s Sun Adelaide is well known for. High UV-R, shade and wind & rain block characteristics make Environshade® the ideal outdoor shade solution for all commercial applications. Fire rated and abrasion resistant Environshade® offers great shading solutions without restricting airflow PVC blinds do. One popular add-on to the outdoor commercial blinds is having your logo or advertising screen printed on to our commercial grade Environshade® blinds coupled with the patented Ziptrak™ Track-Guided Blind System, makes your business stand out while your patrons are protected from the elements. Contact Inviron for more information about ‘Commercial Blinds’ in Adelaide.